Figure 1. Chetter Galloway portrays George Haynes on the porch of the George Haynes slave cabin. When Landon Carter Haynes attended Washington College, George accompanied him and became his personal slave. While there, George learned to read and write – even though slaves were not supposed to be allowed to learn such things. In 1851, Landon Carter Haynes mortgaged the mulatto slave George to Lawson Gifford to secure the payment of personal debts. If the debts were not paid in two years, Gifford was obligated to sell George at the door of the county courthouse in Jonesborough to the highest bidder. This clearly demonstrates the dual nature of a slave in the antebellum South: a slave was a human being, but at the same time a slave was personal property that could be bought or sold. During the Civil War, the whereabouts of George, Charlotte, and Cornelia are unknown. The only document stating George’s whereabouts is an 1863 letter from Landon C. Haynes to a George Williams. In the letter, Landon asked Mr. Williams to watch over his house and property, and to have George cultivate the land in timothy and corn. Also during the Civil War, Haynes bought a seventeen year old male slave named John in Knoxville, Tennessee in 1862 from John Baxter. Baxter was a Knoxville lawyer and slave-holder who sympathized with the South, but opposed secession. After the war, the former slaves of Landon Carter Haynes disappear from the record books. It is not known if any of his slaves continued to live with him or if they created new lives elsewhere. George’s son Habakkuk grew up in Northeast Tennessee and George’s descendants still live within the area. Figure 2. 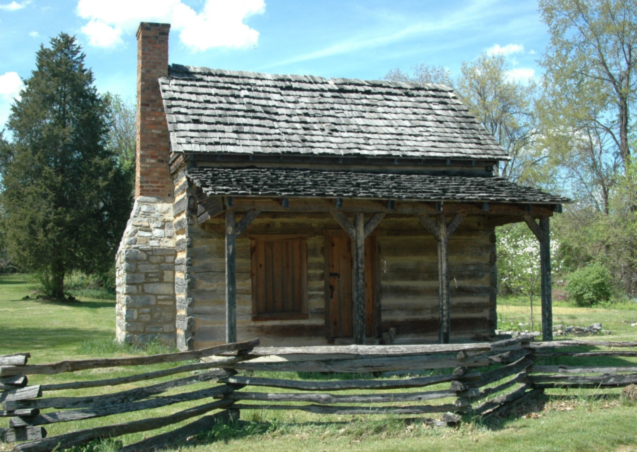 A reconstructed cabin of the mid-nineteenth century that once belonged to the Fox and Harwood families. The cabin sits on the site of the possible location of the Haynes slave cabin. Courtesy of Natural Concepts.